Scotland manager Gordon Strachan says he does not want to be drawn against Norway in the Euro 2016 qualifiers. The draw is in February and, despite beating them 1-0 in Molde on Tuesday, Strachan acknowledged their quality. "I wouldn't really want to see them when the draw comes out," he told BBC Scotland. "They're not bad. "They played well. It was an interesting system they played. Their players tonight as individuals probably did better than ours." Scott Brown's 61st-minute strike gave the visitors a win completely against the run of play in the friendly match at a snowy Aker Stadion, meaning the Scots are undefeated in four games. Per-Mathias Høgmo's Norway side had 19 shots on goal, in contrast to Scotland's three. "We were fortunate we had some brave defending and a terrific goalkeeper," said Strachan. "We tried something in the first half but because of the circumstances we never really got going. "I thought we played so far away from each other it was difficult to put a combination of passes together, especially on a rough surface, and we struggled. "[It] got a wee bit better in the second half and we played closer to each other." Scotland keeper David Marshall twice made crucial saves from Marcus Pedersen as a profligate Norway came forward time after time. Strachan felt the condition of the pitch affected his side but believes there were still positives albeit from an unconvincing performance. "Another away victory, which was good," he added. "Positive that the attitude's decent, that's good. We have got a lot of other players to call on, that's for sure. "So there are things we can take away as we get on the plane tonight - no goals against us in three games against very good opposition, which is good. "Everybody that's been with us this week has impressed in one way or another. They've given us something whether it's on the pitch or off the pitch. So nobody has let themselves down that way." 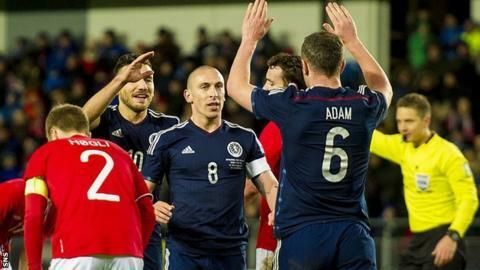 Brown's goal was his third for Scotland and he too accepted the win was not completely justified. "The lads fought and battled all the way," he said. "We didn't play at our best - we know that - but we got the result and that's what we came for. "I think the pitch played a big part. It was soft and soggy and we couldn't pass the ball as well."